The Suffragents is the untold story of how some of New York’s most powerful men formed the Men’s League for Woman Suffrage, which grew between 1909 and 1917 from 150 founding members into a force of thousands across thirty-five states. 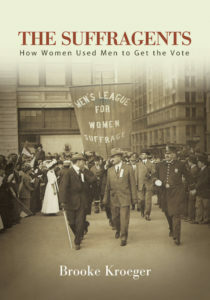 Brooke Kroeger explores the formation of the League and the men who instigated it to involve themselves with the suffrage campaign, what they did at the behest of the movement’s female leadership, and why. She details the National American Woman Suffrage Association’s strategic decision to accept their organized help and then to deploy these influential new allies as suffrage foot soldiers, a role they accepted with uncommon grace. Led by such luminaries as Oswald Garrison Villard, John Dewey, Max Eastman, Rabbi Stephen S. Wise, and George Foster Peabody, members of the League worked the streets, the stage, the press, and the legislative and executive branches of government. In the process, they helped convince waffling politicians, a dismissive public, and a largely hostile press to support the women’s demand. Together, they swayed the course of history.